Love taking Live Photos with the iPhone 6s? These 3 apps can share Live Photos even outside the iOS ecosystem. The ability of the iPhone 6s and 6s Plus to capture Live Photos is nothing short of magic. Live Photos are not GIFs nor video, but still JPEG images that “move” once you deep-press on your iPhone screen. Anyone with an iPhone running the latest iOS 9 can view them, but the only way to share them is sending them via iMessage or posting them on Tumblr, which just recently became the first photo-sharing app to support Live Photos. And the only way to store a fully animated Live Photo is by uploading it to the iCloud Photo Library. Just because Live Photos don’t have widespread support on social media and file storage services yet doesn’t mean that you can’t share them on Instagram or save them in Google Photos. These three iOS apps can help you convert your Live Photos into GIFs or video—and they offer a few other nifty photo features too. If you are looking for an app that simply converts Live Photos into GIFs or video, the easiest to use is Lively (iTunes). After launch, the app surfaces only the Live Photos from your camera roll. Once you pick the one you want to convert, Lively gives you the option to choose whether you want to convert it as a GIF or as a video file. GIFs are great if you want to share them via SMS or a messaging service like Facebook Messenger, Slack and GroupMe. Lively also gives you a few playback options if you choose to convert your Live Photo as a GIF. You can speed it up or play it in slo-mo, as well as play it backwards or in auto-reverse. Choose to convert your Live Photo to a video if you want to post it on Instagram or Vine. Lively recently got a 2.0 update that brings more functionality to the app. Lively’s latest version lets you trim your Live Photo before converting, so you can remove any unwanted parts you accidentally took while trying to capture the perfect moving image. Lively 2.0 also lets you pick out a still frame from your Live Photo and save it to your camera roll. The app is free, but it costs a single in-app purchase of $2 to remove the Lively logo watermark from appearing in your exported GIFs. 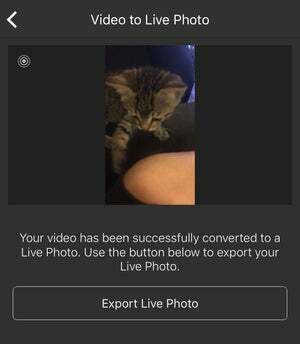 Converting Live Photos as GIFs or video works very similar in Live Studio (iTunes), but unlike Lively, this app does not offer customizable playback options when converting a GIF. If you want to convert the Live Photo as is with no trimming or auto-reverse, the Live Studio does it fine in just a few taps. The app costs $0.99, and it does not tack on any sort of watermark to your exported files. The best thing about Live Studio, however, is that it also works the other way around: giving you the option to convert videos, GIFs and photo-bursts into Live Photos. Talk about magic, the Live Studio app has somehow tapped into Apple’s Live Photo-making technology. We converted a video clip into a Live Photo, and we were able to activate the Live Photo when we deep-pressed it. This works even with videos clips that are longer than three seconds (Live Photos “move” by capturing 1.5 seconds before and after you tap the shutter), in essence giving you the ability to create longer-lasting Live Photos. This is great for converting a video clip or GIF that you would like to set as an animated wallpaper on your iPhone 6s. Let’s say you take so many Live Photos that you want to share a few of them in collage form, PicPlayPost (iTunes) will help you do just that. 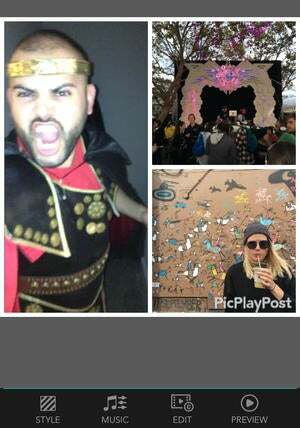 This app creates a single collage from different types of media: photos, video, GIFs and now Live Photos. 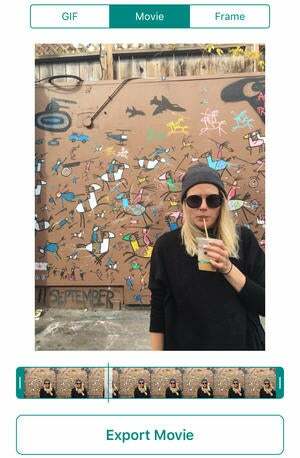 The app is free, but it’s a single $3 in-app purchase to remove the watermark from all exported collages. Begin by selecting the layout of your collage and tap to add a “Photo & GIF.” If you pick a Live Photo, the app will ask you if you want to use the still photo or the Live one. You can choose whether each Live Photo plays on a loop, and even add music to your moving collage. After you finish putting it together, PicPlayPost will convert the Live Photo collage as either a video or a GIF.